Just because you’ve installed a high-efficiency heat pump does that mean you’re getting the level of performance you should be? It’s always a good idea to watch your utility bills closely to keep tabs on your usage. Jeff in Moline, Illinois did just that and it paid off for him as you’ll see in his HVAC prices letter. He shares theTrane XL14i heat pump price but more importantly reminds us of the need to pay attention to our energy bills. Maximum SEER of 15 and a 9.85 HSPF, both Energy Star qualifying levels and eligible for a tax credit. WeatherGuard II top protects the unit against falling twigs and ice. Built-in filter dryer maximizes performance and durability. Climatuff compressor is efficient and durable, and is made more quiet with the use of a compressor insulation blanket. Galvanized steel cabinet and louvers with baked enamel finish produce longer life and continued good looks. Quick-sess panel makes inspection, maintenance and repair easier. Warranty: 10 years on the compressor, parts and related XLi components installed together. Extended warranties that cover labor for 10 years are also available. “Last spring I had a Trane XL14i heat pump installed after shopping heat pump prices for several months. 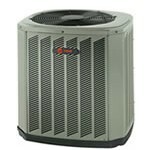 The Trane offered high 15 SEER and was priced competitively, a perfect combo. I received 3 pretty comparable bids and went with the one from the contractor who is a friend of my dad’s. It replaced a unit that 2 contractors told me was a 9 or 10 SEER so I was expecting significant cost savings on energy. The summer wasn’t any hotter than the previous one – I checked on that too and there was little difference. And the first month there was little difference on my energy bill! After the second month I called the contractor and after hemming and hawing for 5 minutes about increased electric costs and hotter weather (I’d compensated for the very slight uptick in kilowatt cost and I refuted the “hotter weather” alibi with facts) he agreed to come out and look at it. Jeff makes a great point – don’t simply assume you’re getting more efficient heating and cooling just because you’ve installed a more efficient system. Take the time to check, doing some math where needed to take current versus past electrical rates into account. Even a qualified contractor can leave behind “minor issues with installation” that will wreak havoc on your unit’s efficiency and may even ruin your unit. Do the best you can to find the most experienced contractor but then stay on top of your costs to make sure you’re getting your money’s worth.